The 3rd Korea-Singapore forum was co-hosted by the S. Rajaratnam School of International Studies (RSIS), The Korea Foundation and the Korean Institute of Southeast Asian Studies (KISEAS) on 19 July 2017, at the Marina Mandarin Singapore. 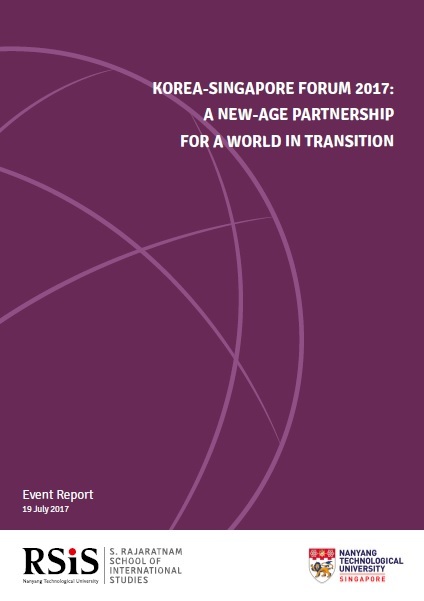 Titled “A New-Age Partnership for a World in Transition”, the forum was organised under the auspices of the Ministry of Foreign Affairs of the Republic of Korea and the Ministry of Foreign Affairs of Singapore. Policymakers, government officials, and representatives from academia, think tanks, businesses and the media from both countries participated in the closed-door forum. With the aim of using this forum to enhance Korea-Singapore ties, the forum saw participants engage in lively discussions about the evolving dynamics in the Asia Pacific region as well as the prospects for regional and bilateral cooperation particularly in the area of the digital economy. The forum’s delegates agreed that there was potential for the Republic of Korea and Singapore to work together on a wide range of issues including the fight against climate change and the championing of free trade in an increasingly protectionist world.